For the past month or so, the National Park Service has kindly placed a brightly lit sign on the northeast side of Potomac Park (by Hains Point) that “encourages” cyclists to stop at intersections. For a while, the Park Police were stopping cyclists who rode through the stops without even pausing or putting a foot down, but it seems they’ve now taken a break from that and left the sign as the primary reminder. I was not too annoyed with this sign at first. It’s probably a good reminder to cyclists that we should be taking care at intersections. However, the longer the sign has sat there, the more irritated I’ve become. Maybe it’s because the sign impedes the view of the channel, and the channel is actually pretty. But as I have the pleasure of considering this sign every single day, I’ve developed some additional complaints about it besides its blocking of my view. First of all, I don’t know why the message had to be a two-parter. Was it so that we would put our feet down and anxiously await screen two? “Bicyclists must obey traffic…” What, sign, what? Screen Two: “LAWS.” What? Sign, tell me something I don’t know. I stopped for that? 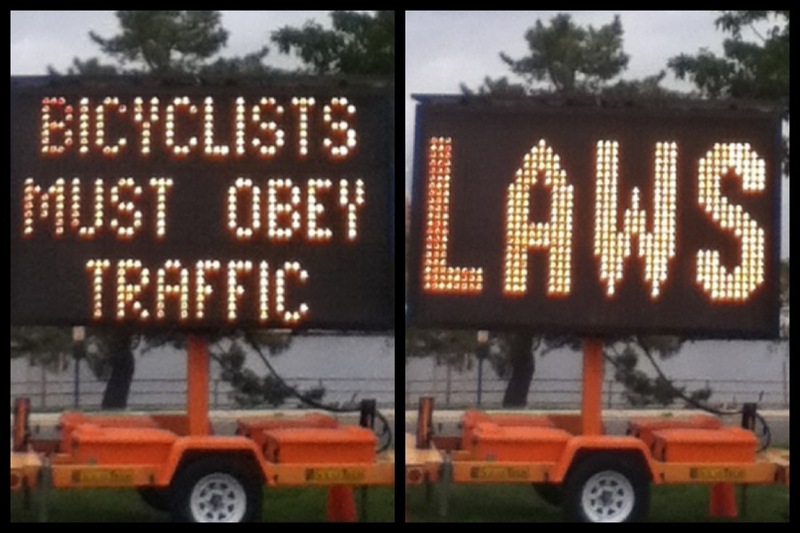 They could at least have said something like “Bicyclists must obey traffic ZOMBIES.” Much more thought-provoking. If they had left the message up to me, I would have ditched the two-screen message and used something simpler. Something like “Bicyclists, stop at STOPS.” That seems to be the point that’s trying to be made. I definitely would have left some oversized-capitalized words in there, too. It’s fun to think about writing in a MIX of CAPS and lower CASE. Try it. I’m SURE that you will AGREE. Also, used effectively, messaging in this way can really TICK PEOPLE OFF. I suggest a one-screen message reading “ALL must stop at STOPS.” Why single out cyclists? (And again, why make us read two screens? This is D.C.; we’re busy.) Yeah, ALL STOP. I have seen LOTS of folks not stop on that corner who were NOT the PEDALING kind. They never got specially illuminated signs for their transgressions. Tour buses, cars, pedestrians, ducks. Let’s ALL stop. Not only is it the LAW, it also helps EVERYBODY stay SAFE. 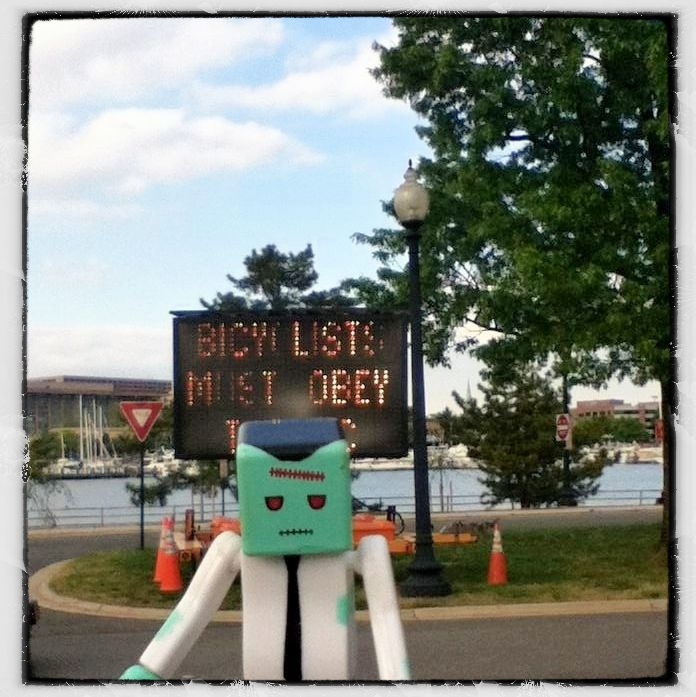 And then, ALL should maintain a reasonable speed when going down Hains Point and pass safely. That last part wouldn’t go on the sign, it’s just something I think everybody should do. Better yet, take it down, at least for a while. We’ve all seen it and we’ve ALL read it. The MESSAGE has been RECEIVED. Foot down. Brilliant analysis and delightful articulation. That sign pretty much sums up the love the NPS has for cyclists. Nicely put, MG.
Whomever makes these signs isn’t that good at it. For instance, the one at the corner of Thompson boathouse parking and Rock Creek says “No Turn On Red” and then below it: “At All Times”. Why not just say: No Turn On Red EVER? I’m totally obsessed with revising these road signs at the moment. Agree. The sign you describe needs an edit!! Stupid signs, most likely put up by a non-cyclist. I see plenty of motorists around where I cycle in IL, blow right through stop signs. I don’t really have an issue as a solo rider, not stopping for a stop sign, IF there are no cars around. IF there is a car, I always stop. I also think the world has bigger issues, than putting signs up like these. Here in St Louis along the Riverfront Trail they put up stop lights along a busy fast moving street called Hall street. When a cyclist wants to cross they press a button and it changes the light to red for about one and a hlf minets. Cars Still blow the red and don’t stop! I hadn’t seen this sign, but the two-part thing is annoying. I also agree that it would have been far more effective to communicate the desired action rather than vague “laws.” I like the zombie picture though – reminds me of the similar electronic sign up for the Silver Spring Zombie Walk that actually had messages about zombies. Oh, wish I had seen those! Guess what? I went by that area tonight and the sign is gone. Either they’ve put it away for the time being or they’re incorporating my suggestions for the message, ha! !